This RIB folds into a compact shape that’s 13” tall and 7 1/2’ long, so it fits where other RIBs can’t. Quick and Easy: Unique design can be inflated or deflated in less than 10 minutes. Stows Small: Fully folding transom stows as easily as a sailboard and creates a compact, easy-to-transport flat package. You can easily transport our Compact RIB in the back of a long-bed pickup or an SUV with the seat folded down. Pretty Tough: Tubes are made with fabric specifically created for excellent air-holding ability, and have reinforced cone ends to resist tears and punctures while the custom-color rubstrake stands up to bumps with the dock and looks good doing it. Proven Performer: The solid fiberglass hull has a deep-V design that planes quickly and offers a smoother ride than previous models. Max power is a 10-hp short shaft outboard. 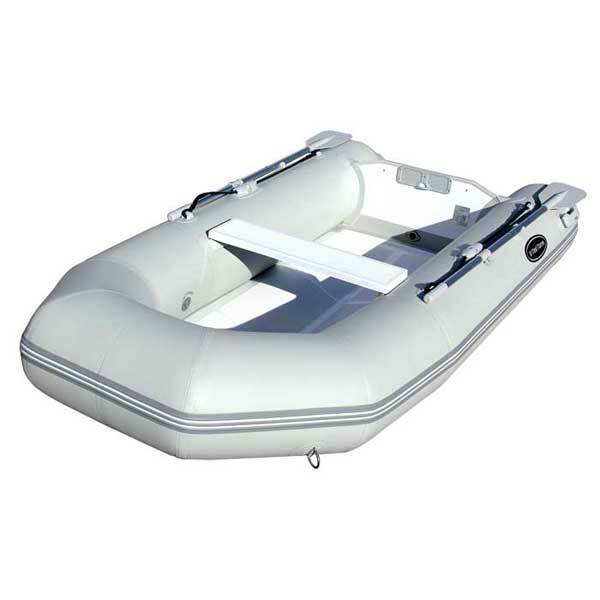 Well-Rounded: The RIB-310 comes with USA-made Halkey-Roberts valves, a wooden bench seat, aluminum oars, oarlocks, towing rings, a bow handle, an inflation pump, a carry bag and a repair kit.